American Creek Resources is a precious metals exploration company with high quality assets in significant mineral belts of British Columbia, close to infrastructure. These include properties in B.C. 's prolific Golden Triangle, one of the richest areas of mineralization in the world. 2018 drilling on Treaty Creek, including 0.98 g/t gold over 563.8m, will significantly increase the known extent of mineralization and work towards preparation of a NI 43-101 Mineral Resource. 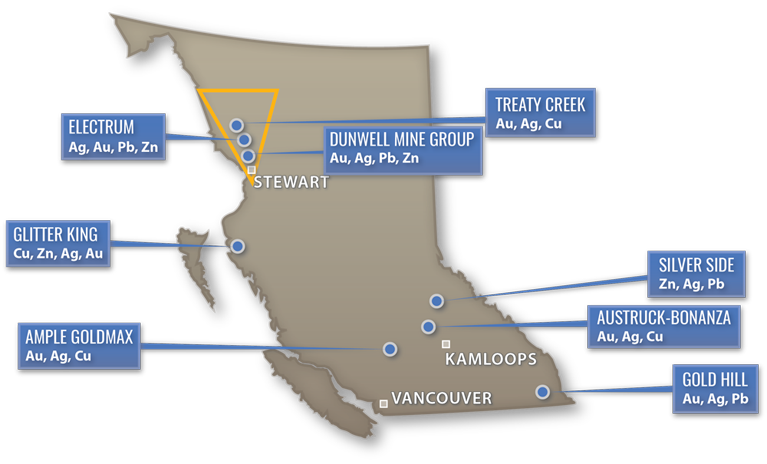 High-grade gold (up to 61g/t) with extraordinary silver, lead and zinc sampled at the Dunwell Mine in BC’s Golden Triangle The exploration program on the high-grade Gold Hill property, believed to be the primary lode source of Canada’s 4th largest placer deposit, has completed drilling the four holes planned with assays expected in the new year. © 2008 - 2019 Copyright American Creek Resources - All Rights Reserved.